Four ingredients and the minimum of time is all it takes to make a super, simple recipe for rhubarb fool, that most whimsical of British desserts. The blend of rhubarb, gently cooked with honey, then whipped together with mascarpone and cream and away you go, What could be easier? Make this recipe with forced or outdoor rhubarb. If using outdoor make sure any stringy parts are removed before cooking by gently peeling the outer skin. So simple is the recipe and combination of ingredients, is it any wonder there are many variations of this lovely dish. See below for some of my suggestions. And, if you ever wondered why it is called a fool? You will find our thoughts ​on this recipe. Place the rhubarb pieces into a non-reactive saucepan. Add the honey. Cook over a gentle heat for approx 20 mins until the rhubarb is a soft pulp. Put to one side and leave to cool. Reserve four dessertspoons of the pulp. Beat the mascarpone in a bowl until smooth and loose, then gently stir in the rhubarb. Do not over mix, the cream; it should have a marbled effect with the rhubarb nicely visible. Whip the cream to soft peaks, then, again, gently fold into the rhubarb mix. Serve the rhubarb fool in a glasses with the rhubarb pulp on top. Pop the glasses into the fridge to chill. Remove from the fridge ten minutes before serving. Great alongside the fool is a ginger biscuit, a small piece of Parkin or shortbread. 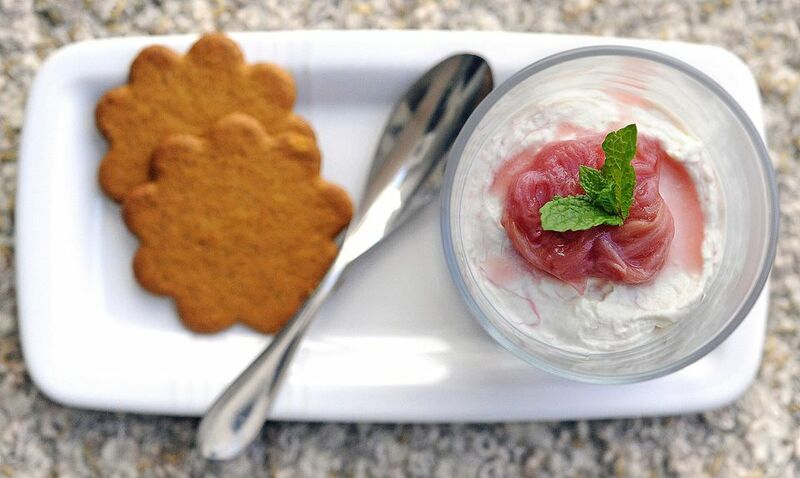 Why Is This Dish Called a Rhubarb Fool? This dish dates back centuries with mentions as early as the 15th. Why it is called a fool has no clear definition, the closest understanding is that it derives from fouler (to press) as in pressing the fruit into the cream. There are two classics to this famous dessert, made with rhubarb or with gooseberries. These two fruits work so well in this context as they have a slightly sour taste. It is this which when folded into the sweet cream which makes a Fool so delicious, a perfect balance. Gently fold a dash of Elderflower cordial into the Fool to create a different slightly floral flavor. Remove the honey, in this recipe, for a less sweet and to allow the sweet-sour balance to win. Remove the mascarpone and replace with a little English custard. The result is a creamier, sweeter and smoother Fool which many prefer.